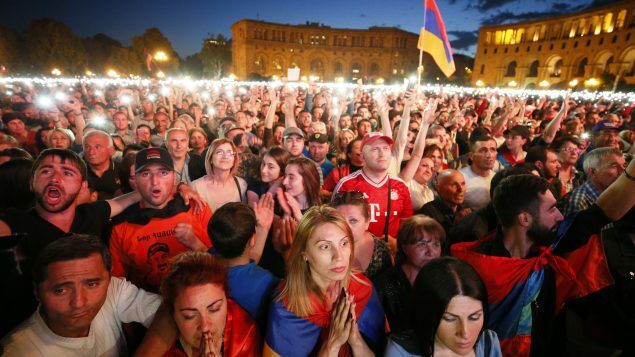 Armenia after Sargsyan: do the people really need a savior? A scene from the May 2 protests in favor of Pashinyan. Source: Radio Canada International. Although Serj Sargsyan resigned as Prime Minister, in the parliamentary vote on May 1, Nikol Pashinyan failed to secure a majority of votes, even though he was the sole candidate under consideration. After repeating mobilizations, including a vast general strike on the following day, the ruling HHK finally decided that they would vote for Pashinyan in the next vote in the Parliament on May 8. After a nine-hour-long question-and-answer session, the Armenian Parliament on 1st May voted 55 to 45 against the candidate of the liberal party coalition “Yelk”, Nikol Pashinyan. All 55 “no” votes came from the ruling HHK, the party of former President and Prime Minister Serj Sargsyan. It was they who in the debate tried to discredit the candidate of the unified opposition (including the Daschnakzutyun who were until the end of April part of the government coalition with the HHK). Not only did they ask questions without end, but some of these questions which were openly nonsensical, as they for example asked how many bullets a Kalashnikov has. But all of this was part of a tactic the HHK felt compelled to follow since their reputation is very bad at the moment. Even before the general strike which Paschinyan called on the evening of Workers’ Day, the stores and supermarkets such as “City supermarket” or “Sas supermarket” were boycotted and blocked by the activists because the owners are from the HHK. It is no surprise that the growing anger of the mass movement resulted in an astonishing general strike the next day: a general strike the country had last seen in the independence movement about 30 years ago. The general strike in Armenia on May 2 was a general strike worthy of the name. The whole country was paralyzed, all roads in and out of Yerevan blocked. In the city itself one couldn’t move with the car. Taking the bus or the metro? Not possible as they were on strike too. Workers from all sectors joined the strike; students, pupils, teachers, even actors and singers took part. The most notable strike probably took part at the Zvartnots Airport where workers together made a moving declaration that they would join the mass movement. As the roads to the airport were closed, basically everything was shut down. It is also very important to mention that the working class did not only choose not go to work but also took part in various forms of civil disobedience. Party centrals from the hated HHK were surrounded also. The shut-down was so large that the protesters even blocked the ministries. The roads only and partly opened in the afternoon so that people could join the central rally at Republican Square. And indeed, they joined once again in hundreds of thousands. After the HHK then announced that they would finally vote for Pashinyan, the “candidate of the people” on 8th May, it was clear that the movement was once again successful, having managed to overthrow the government on 23rd April. They did not pose the question of power in a struggle between classes as Trotsky prescribed it but they decided that the next Prime Minister would not be from the HHK. It doesn’t necessarily mean that the movement will now slowly fade away. The recent days showed that Nikol Pashinyan is in a sense truly the candidate of the people as he is by far the most popular figure in Armenia right now. Of course, he would be nothing without the mass movement. What would he be if the people had not participated spontaneously in acts of civil disobedience, blocking by themselves the streets? All these days since April 13, when the movement started, Pashinyan himself always took part in the actions, even hurting his hand as he tried to break through a police blockade. During the movement he managed to broaden his leadership over the mass movement to the point where he is now almost seen as a messianic figure promising to liberate Armenia from corruption and poverty. This meant also that the actions including the general strike were always peaceful and did not have the opportunity to be more militant. Although he himself called for “revolutionary committees” which should occupy the institutions in his famous concept of the “Velvet Revolution” he always reminded the people that they should respect the bourgeois constitution and law of Armenia. In his mind it was always a democratic movement whereas the people participated not only to have free and fair elections but also to have better living conditions — a typical characteristic in poor semi-colonial countries. But the credibility of democratic demands will very quickly lose its effect if they do not bring about economic improvements. So far, Nikol Paschinyan’s economic and social program is hardly visible. Paschinyan has been careful not to commit himself to an economic program. 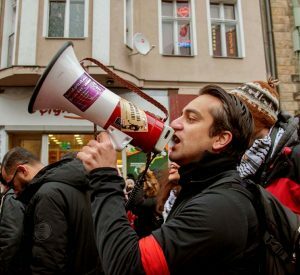 During the movement, Paschinyan not only managed to show himself as an activist but also as a serious statesmen who gained the support of big companies like the Grand Holding Company, Grand Candy or Grand Tobacco. He also negotiated with the co-opted opposition parties like the Tsarukyan-Party of the oligarch Gagik Tsarukyan: They voted and will once again vote for him in the Parliament. As the movement grew and strengthened, questions arose about the role of Russia, as there are about 4000 soldiers in the country who also protect the Armenian-Turkish border. What would Russia do? Would they intervene as in the 1st March incidents? Or even like in Georgia in 2008? Paschinyan was never seen as “pro-Russian” like Serj Sargsyan and the HHK who have close ties to the Russian state and bourgeoisie. But he was also never “anti-Russian”. Asked by journalists whether he was “pro-western” or “pro-Russian” he simply answered that “I am pro-Armenian”. Not only with regard to his management of the movement, where he is in between radicalized students and hated oligarchs, has he been a brilliant strategist, but also with regard to foreign policy. He knew that he could never come to power in bourgeois Armenia against the will of the Kremlin. No surprise that he quickly established close relationships with the Russian Embassy, even stating that he will deepen the relationship with Russia. As he therefore declared his solidarity with the Republic of Artsakh (artificially “independent” but in fact a very important part of Armenia) it is very likely that there will be no big changes in the foreign policy in a region where conflicts are frozen like in Artsakh, South Ossetia and Abchasia. In Armenia itself he promised that after a period of transitional government he will dissolve the Parliament and call for new elections which should be free and fair in a new electoral code. Because of the fact that the masses were victorious against Serj Sargsyan it is clear that they will stay vigilant and closely watch what Paschinyan will do. They’ve experienced their power and with the general strike they showed the strength not only of the working class but also their own as workers in a country where patrons behave like lords who could do whatever they want with the torn workers who are always at risk of losing their jobs. In a country where the working class is shaken by a high unemployment rate and where workers are in danger of falling into poverty. Both the mass gatherings and actions of civil disobedience, and most importantly the general strike, paved the way for the future. A future where between radicalized masses and corrupt oligarchs there will be no compromise. It is for that reason that workers, popular classes and the youth must have no illusions about Nikol Pashinyan and the liberal forces. For the working class and the masses it is crucial to forge an independent political alternative, able to respond to the structural problems of the workers in Armenia, that could be an example for the rest of the region and even beyond. Hovhannes Gevorkian was born and has lived in Yerevan, with much of his family coming from Western Armenia. He is now a student of Law in Berlin and member of Revolutionäre Internationalistische Organisation (RIO) of Germany. One Response to Armenia after Sargsyan: do the people really need a savior? is it true that Armenia has a population of less than 3 mil inhabitants? is it true that USA embassy in Yerevan was the largest US embassy in the world when it was completed in 2005 (currently, the US Embassy in Baghdad is the largest American embassy)?